Imagine a person who spends their entire life sitting on the couch watching and rewatching Clive Barker’s Hellraiser. He does nothing else, gains no education, no relationships with other people, no family, no friends. But he, nevertheless, loves his life, he values everything about it. He is constantly offered the opportunity to do something different, and never chooses to do so. Indeed, his choices are not the result of a lack of information or imagination — he understands perfectly well what it would like to do something else. But he so loves watching the movie that he is simply unconvinced that any alternative would be better for him. Is this person leading a good life, at least for his own sake? Many are tempted to say “no”. After all, this life is not at all well-rounded, it maintains no knowledge or genuine appreciation of the beautiful, does not engage rational capacities (beyond, say, the bare minimum required to rewind a VHS tape). But others say “yes”. After all, what more is required for the good life for a person that they value it highly, perhaps under conditions of full information? It seems we may have reached “intuitive bedrock”. In so many areas of inquiry (though, perhaps, not all), philosophical argument ends up bottoming out in a mere clash of intuitions, of considered judgments. But what happens now? Because these considered judgments will help determine the content and structure of our philosophical theorizing, to determine (once and for all) what the good life is for a person (or whether we should be descriptivists or causal theorists of reference, or whether justified true belief counts as knowledge or not, or — if Lewis Carroll is to be believed — whether modus ponens is a valid rule of inference) we — or so it would appear — need to settle which of these intuitions are the right ones. Thinking of philosophy in this way has some benefits, I think. First, it provides a more compelling account of philosophical progress. Take hedonism, for instance. This classic theory of well-being stands no closer to refutation or general acceptance than when it was first introduced. But while we may be no closer to consensus on whether hedonism is true, we have discovered a number of important features of the view (it can be both objective and subjective), differences in how to express it (sensory versus attitudinal), concepts of which hedonism may be an adequate conception (moral hedonism, axiological hedonism, prudential hedonism), important verdicts hedonism may take on board (the experience machine). If this sort of thing is what we’re up to, we’re, as it turns out, pretty good at it. Second, and to me most important, if we think of the philosophical enterprise in this way, the ultimate task of philosophy becomes fully collaborative. If I’m a welfare subjectivist, the success of the project at which the objectivist is engaged need be no threat to the success of my project. After all, we’re all working together to develop the most complete “atlas”. The fact that, when we reach bedrock, I go subjectivist and you go objectivist need not entail that we are philosophical adversaries. There may be drawbacks; after all, we might be very interested in whether objectivism or subjectivism is true. Giving up the pursuit of the right answer may be disappointing. But I suggest we kick the tires on an alternative, which seems to me a natural result of reflection on the phenomenon of intuitive bedrock. But even if it isn’t, it is up to philosophers how to understand what they’re up to — indeed, up to each individual philosopher. My hope is that thinking of philosophy as a kind of atlas-drawing means that we’re better at our jobs, we see ourselves as working together, and we approach philosophical inquiry much more often in a constructive and collaborative spirit. Featured image: Haringvaten2_wallpaper by Remy Remmerswaal. CC BY 2.0 via Flickr. Dale Dorsey is Professor of Philosophy at the University of Kansas. He has published widely on issues in normative ethics, metaethics, and political philosophy. 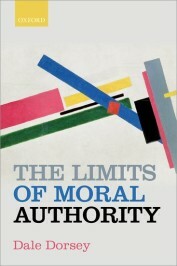 His most recent publication is The Limits of Moral Authority (OUP, 2016). I believe A. J. Ayer said something like this at the start of his “Philosophy in the Twentieth Century”. He likened the world to an island, and philosophy to the rain that slowly erodes away the soil, exposing the hard insoluble rock.